Despite US military efforts, maritime insecurity has been markedly on the rise in the waters off West Africa. This article originally appeared at TomDispatch.com. To stay on top of important articles like these, sign up to receive the latest updates from TomDispatch.com. This story was reported in partnership with the Investigative Fund at the Nation Institute. Additional funding was provided through the generosity of Adelaide Gomer. “The Gulf of Guinea is the most insecure waterway, globally,” says Loic Moudouma. And he should know. Trained at the US Naval War College, the lead maritime security expert of the Economic Community of Central African States, and a Gabonese Navy commander, his focus has been piracy and maritime crime in the region for the better part of a decade. Moudouma is hardly alone in his assessment. From 2012 to 2013, the US Office of Naval Intelligence found a 25 percent jump in incidents, including vessels being fired upon, boarded and hijacked, in the Gulf of Guinea, a vast maritime zone that curves along the west coast of Africa from Gabon to Liberia. Kidnappings are up, too. Earlier this year, Stephen Starr, writing for the CTC Sentinel, the official publication of the Combating Terrorism Center at West Point, asserted that in 2014 the number of attacks would rise again. Today what most Americans know about piracy likely centers on an attraction at Walt Disney World and the Johnny Depp movies it inspired. If the Gulf of Guinea rings any bells at all, it’s probably because of the Ebola outbreak in, and upcoming US military “surge” into, Liberia, the nation on the northern edge of that body of water. But for those in the know, the Gulf itself is an intractable hotspot on a vast continent filled with them and yet another area where US military efforts have fallen short. A recent investigation by the US Government Accountability Office (GAO) found that “piracy and maritime crime in the Gulf of Guinea has escalated” and that “armed robbery at sea, oil theft, and kidnapping is a persistent problem that continues to contribute to instability” there. Not only that, but as Pottengal Mukundan, the director of the International Maritime Bureau of the International Chamber of Commerce, recently noted, piracy in the Gulf has taken on a particularly violent character. What Benjamin Benson, media chief for US Africa Command (AFRICOM), thinks isn’t quite so clear. As the situation in the Gulf of Guinea was worsening, he touted it as an American “success” story, pure and simple. Then he claimed that he hadn’t done so, after which he clammed up completely. What he thinks today is anyone’s guess. He now refuses to say a word about it. Loic Moudouma, for his part, claims to see progress in bringing security to a body of water nearly the size of the Gulf of Mexico that is critical to the economies of a dozen nations. He also credits the United States for its support of security efforts there, even if they have paradoxically occurred alongside an increase in both piracy and insecurity. West African states, says Moudouma, have left waterways ungoverned, turning them into breeding grounds for criminal activity. The problem, he insists, is the poor leadership of the African nations in the region, America’s “partners” on the frontlines of the fight. Their lust for power, according to Moudouma, has put the national security of numerous African nations and the economic well-being of the region at risk, yet the Obama administration only recently feted the area’s most corrupt strongman and the US military regularly partners with his armed forces. “Do not put words in my mouth. I did not say the Gulf of Guinea was a success. I did not say Gulf of Guinea maritime security was a success.” This was AFRICOM spokesman Benson’s response last November when I asked if he wanted to amend his earlier assessment of the Gulf of Guinea shortly after pirates kidnapped two Americans from a US-flagged ship there. I listened to that passage several times. It sure sounded like he was calling the Gulf of Guinea a success. Analysis of Office of Naval Intelligence data by the Government Accountability Office from “Ongoing US Counter-piracy Efforts Would Benefit From Agency Assessments” (GAO 14-422). The United States has been fighting African pirates since the early days of the republic—battles so formative that, among other things, they established a long-standing pattern of dealing with foreign policy problems through armed interventions and also inspired the iconic phrase “the shores of Tripoli” in the Marine Corps hymn. By the late 2000s, American ships were once again under attack off an African coastline and the US military had again been dispatched to kill pirates. This time around, the conflict centered on the Horn of Africa—not North Africa—specifically the waters off the coast of Somalia. In the 1990s, Somalia descended into a maelstrom of violence, which has abated somewhat in recent years but continues to plague that nation and has since spread beyond its borders. In 1993, when American troops infamously arrived in its capital, Mogadishu, in support of a United Nations humanitarian mission, they suffered eighteen killed and two helicopters shot out of the sky in the “Black Hawk Down” disaster. Somalia was then repeatedly battered as Islamic militants struggled for control against US-backed militias and various African armed forces. During those years, neighboring nations began illegally fishing in Somali waters, prompting local fishermen to arm themselves and collect “taxes” from foreign vessels. Some of these proto-pirates soon began hijacking relief food shipments, while others moved on to attacking merchant vessels and oil tankers. By 2008, Somali swashbucklers were, by some estimates, raking in as much as $150 million annually. That same year, the US National Security Council (NSC) developed a document it called “Countering Piracy off the Horn of Africa: Partnership and Action Plan.” Its focus was the prevention and disruption of maritime crime off the coast of Somalia. Despite this, the number of reported attacks in the region nearly doubled between 2008 and 2009, and the next year the GAO weighed in with recommendations for the NSC to “reassess and update its Action Plan; identify metrics; assess the costs, benefits and effectiveness of US counter-piracy activities; and clarify agency roles and responsibilities.” For the next four years, however, the NSC failed to respond. In those years, the United Nations also passed numerous resolutions related to maritime crime in the Horn of Africa, authorizing international militaries to conduct counter-piracy efforts. Naval patrols and other missions by NATO and the European Union as well as Australia, Bahrain, Canada, France, Jordan, South Korea, the Netherlands, Pakistan, Saudi Arabia, Singapore, Spain, Thailand, Turkey, China, Russia, Japan, India and the United States—in addition to the use of armed mercenaries to protect ships and a slew of new policies designed to thwart attacks—have had a demonstrable effect. According to the International Maritime Bureau, piracy incidents in the Horn of Africa declined from 219 in 2010 to just 15 in 2013. “At the peak point of operations, up to 30 vessels from as many as 22 nations were engaged in counter-piracy operations in the region,” Rear Admiral Joseph Kuzmick told Congress last year. “International naval forces have thwarted pirate attacks in progress, engaged pirate skiffs, and successfully taken back hijacked ships during opposed boardings.” While a truly international effort, the battle against the Somali pirates ranks as one of the few true bright spots for the US military in Africa. Over these same years, the United States has also been pouring money and effort into maritime security activities on the other side of the continent with drastically different results. From 2007 to 2011, the United States provided $35 million to West and Central African countries for coastal radar, boats, equipment and maritime security training. These efforts included the African Partnership Station (APS)—a shipboard effort designed to “provide quality military training to sailors and leaders of [partner] nations.” Under the auspices of the APS, the United States annually hosts four regional security exercises: Cutlass Express, Phoenix Express, Saharan Express and Obangame Express, the latter based in the waters off West Africa. By 2012, five years after it was launched, APS activities involved more than thirty African, European, and North and South American countries. In last year’s iteration of Obangame Express, some sixteen nations participated in exercises in the Gulf of Guinea, including Benin, Cameroon, Côte d’Ivoire, Equatorial Guinea, France, Gabon, Nigeria, Republic of Congo, São Tomé and Príncipe, Togo and the United States. This year, twenty nations were involved, including eleven that took part in boarding exercises conducted aboard thirty-six different vessels in the Gulf. AFRICOM and the US Coast Guard also provide counter-piracy training as well as instruction in search and seizure skills through the African Maritime Law Enforcement Partnership program. In addition, the United States has held seminars, symposiums and conferences devoted to maritime security; it has donated spare parts and even entire ships to West African allies, provided hands-on maintenance instruction, advised personnel from regional navies and coast guards, and offered aid for maritime counter-narcotics and law-enforcement projects. Despite all these efforts, maritime insecurity has been markedly on the rise in the waters off West Africa. When I spoke last year with AFRICOM’s Benson about signs of US “success” in the Gulf of Guinea, he cited US efforts that culminated in a conference where West and Central African leaders would hammer out a comprehensive strategy to improve maritime security, with a formal code of conduct for states to follow. At the time, however, the conference—organized by the Economic Community of Central African States, the Economic Community of West African States and the Commission of the Gulf of Guinea—had yet to take place. How could that count as a success, I wondered, especially when signs of regional failure were all too evident? According to the US Office of Naval Intelligence, incidents of piracy and maritime crime in the Gulf of Guinea jumped more than 80 percent from 2010 to 2013. Last year, according to Oceans Beyond Piracy, an advocacy group focusing on maritime security issues, West African pirates attacked at least 1,871 “seafarers” and 279 were known to have been taken hostage. Additionally, 1,209 vessels were boarded by pirates. Experts now estimate that $2 billion is lost each year in port revenue, insurance premiums and security costs due to maritime crime in the Gulf of Guinea. It was at a conference hosted by the Department of Defense’s Africa Center for Strategic Studies, held on the periphery of the White House’s US-AfricaLeaders Summit in August, that Loic Moudouma spoke positively about US assistance in the region while also asserting that the Gulf of Guinea was the most insecure and violent waterway in the entire world. When I questioned him about this apparent paradox—asking why maritime insecurity has escalated during years of increased US assistance—he pointed to the slow pace in implementing plans and the relentlessness of the region’s pirates. He also put the blame squarely on America’s allies in Africa. “The state is still absent from the sea,” he said, drawing attention to the inability of nations to police their territorial waters. Moudouma also called out the region’s heads of state. “Over the last decade, our political leaders have been investing in how to stay in power as long as possible,” he said. Moudouma sees systemic problems at the ministerial and presidential levels in African governments and called for more action aimed at heads of state. 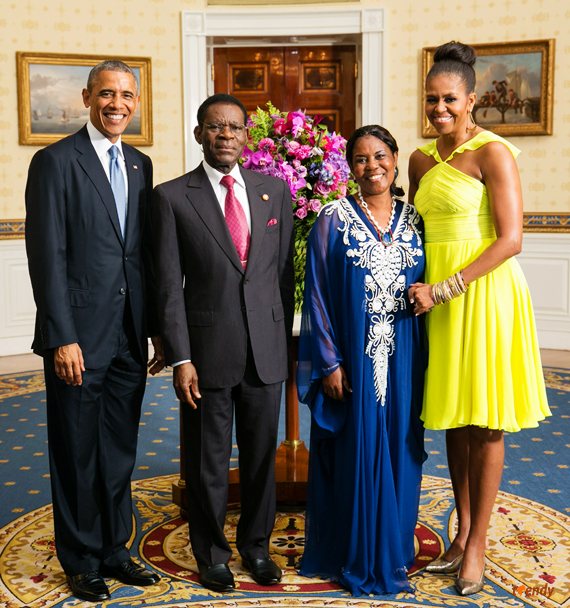 This type of pressure, however, didn’t seem to be on the table at that recent White House summit when President Obama hosted—and stood for a smiling portrait with—Equatorial Guinea’s President Teodoro Obiang. Since he first seized power in a coup thirty-five years ago (just before Obama began his freshman year in college), Obiang has ruled that tiny, oil-rich nation on the Gulf of Guinea with an iron fist. A perennial pariah state, his country is noted for its utter lack of press freedom and political opposition, and a profusion of corruption, oppression and human rights abuses, including extrajudicial killings and the imprisonment and torture of opposition figures. While most of Equatorial Guinea lives on about $2 per day, the Obiang family lives the high life, complete with a fleet of flashy cars—including Ferraris, Rolls-Royces and Lamborghinis—not to mention private jets. 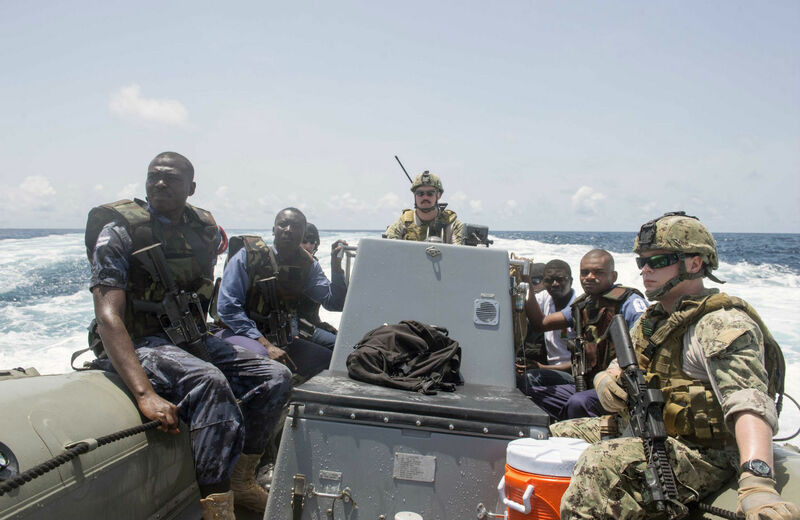 On June 19, the Government Accountability Office published a new report, “Ongoing US Counter-Piracy Efforts Would Benefit From Agency Assessments.” It contrasted the much-improved situation off Somalia’s coast with the “persistent problem” of piracy and maritime crime in the Gulf of Guinea. It also drew attention to recommendations—like systematically tracking costs and identifying which agencies will lead or support various counter-piracy efforts—that, after four years, had yet to be implemented. US failures when it comes to the Gulf of Guinea are many: a failure to address the longstanding concerns of a government watchdog agency, a failure to effectively combat piracy despite an outlay of tens of millions of taxpayer dollars, and a failure to confront corrupt African leaders who enable piracy in the first place. In fact, the rolling out of a red carpet in Washington for an astoundingly corrupt West African strongman, precisely the type of leader even a Pentagon-approved analyst cites as the source of regional instability, mirrors other US efforts in Africa, from Libya to Mali to South Sudan, which have crumbled, collapsed, crashed and burned. For the better part of a year, following his email outburst about putting words in his mouth, US Africa Command spokesman Benjamin Benson has ignored my repeated requests for comment or clarification when it comes to the Gulf of Guinea. And it’s little wonder. After all, as the US military has shown repeatedly in its “pivot” to Africa over these last years, it’s so much easier to claim success than to achieve it.